reckoning) and seasoned campaigners. Among those seasoned campaigners are Mark Peat, and Peppa the Cockatoo who between them have clocked up plenty of miles for the cause. 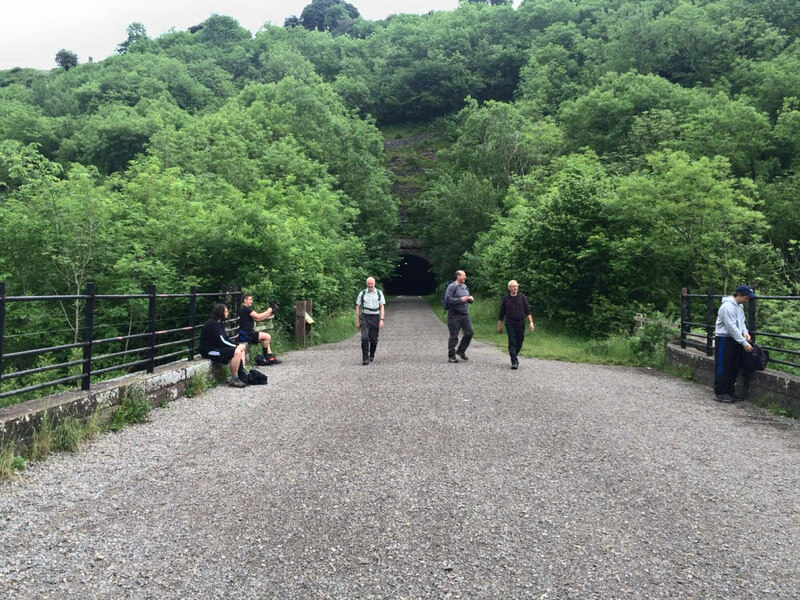 Well, it wouldn’t be a Chatsworth Challenge walk without a shot of the Monsal Head Viaduct would it? 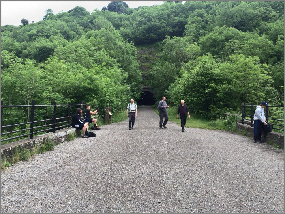 Martin’s taking a breather while Gary, Brian, (who looks to be dispensing a bit of local history) and Howard catch up. I don’t think the lad beyond Martin is one of ours but there’s no mistaking Nigel having a rummage in his bag for a sandwich. June is a great time of year with all the trees looking their best. If Lathkill Dale isn’t the most attractive of Derbyshire’s dales (and I can already hear the protests of those who believe Dovedale claims that title) it is still right up there with the best. 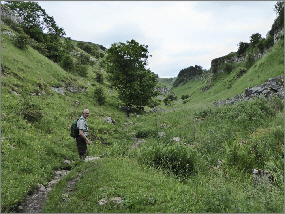 Lathkill Dale resembles a dry river bed as our walk leaves Monyash but soon takes up the more traditional appearance. 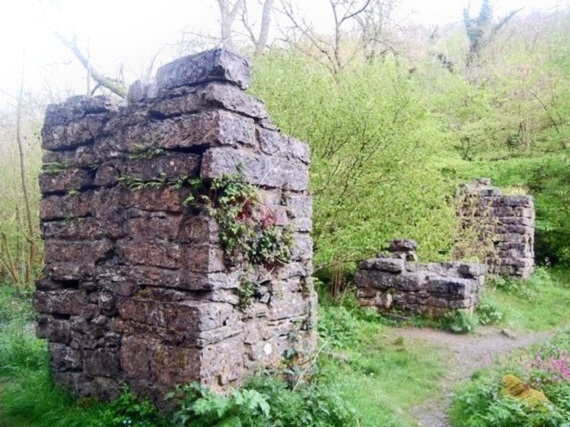 There are a lot of historical sites in this dale, (no I didn’t say sights, I’m not referring to Gary) but you can read about those later in the narrative. 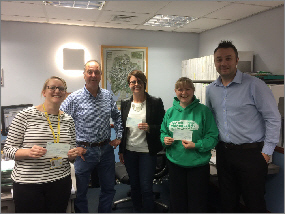 Lynne Desborough (Cancer Research UK), Stacey Rhodes (Macmillan Cancer Support) Mark Spittle (walk stalwart). The section of the dale between Haddon Grove Farm and Over Haddon was once home to several very profitable lead mines, of which the most important was the Mandale Mine. 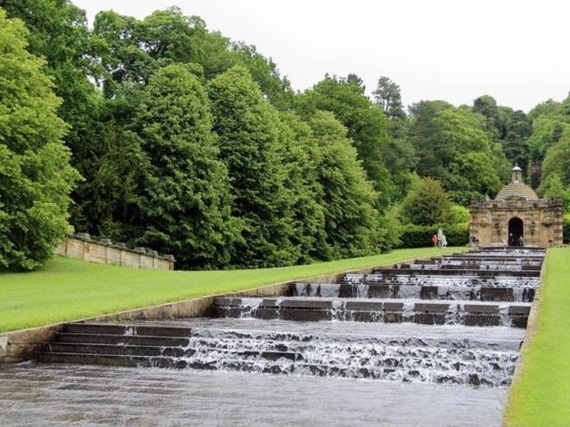 The Cascade and Cascade House is a set of stone steps over which water flows from a set of fountains at the top. It was built in 1696 and rebuilt on a grander scale in 1701. 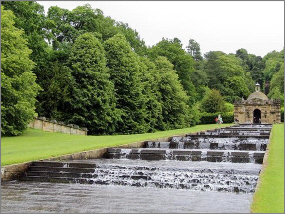 In 2004 the Cascade was voted the best water feature in England. It has 24 cut steps, each slightly different and with a variety of textures so that each gives a different sound when water runs over and down them. (see additional photograph 9 below). 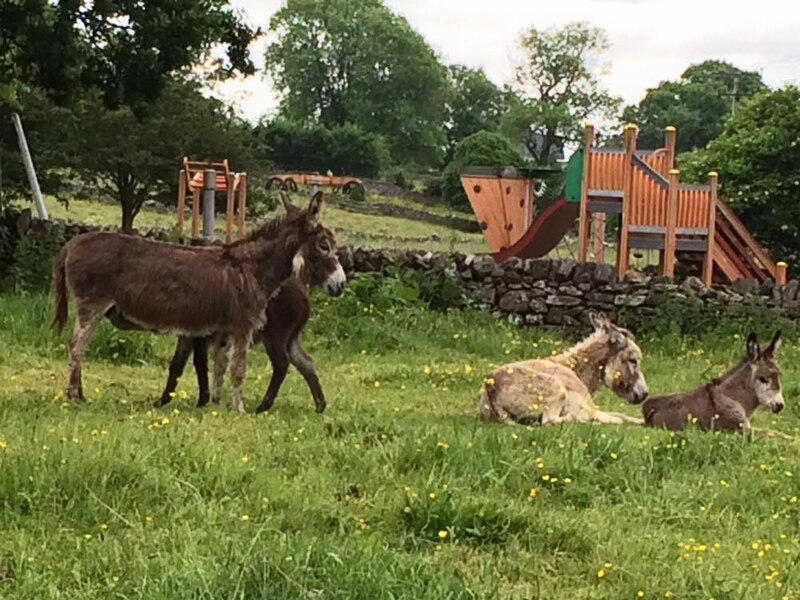 And finally… some donkeys, four of them if you include the one that’s trying to hide. 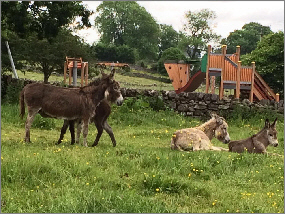 ‘What are four donkeys, with one of them trying to hide, doing on our Website’ I hear you cry. The answer is that Phil Lynskey (Webeditor) and Wendy Lynskey (Checkpoint Monitor on numerous occasions) really like donkeys (who doesn’t? - Ed), and while in previous years we’ve had sheep, cows, deer and even llamas by the score we’ve never had donkeys. 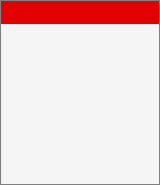 (about time! - Ed). I know Colin took the picture on the way round the 22 miles but I don’t know the location. However Phil and Wendy, donkeys... juste pour vous deux. 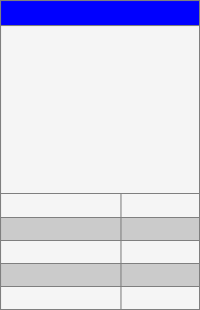 (GM). At three months Oscar is our youngest walker to date and looks as though he just can’t wait to be off (he’s not really fast asleep, he’s just examining the inside of his eyelids). It’s good to see Mark Spitts here again, even if the light reflecting back off his Manchester milk bottles is making things difficult for the photographer. The three of them really enjoyed meeting their fellow fund raisers for the first time, and also came up with some great ideas of how we can improve our event for 2017. The Oesophageal Patients Association were not represented but they did get their cheque posted out in the usual manner. 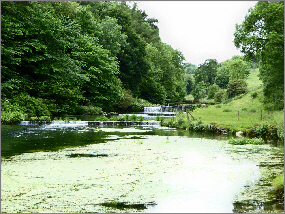 By the time the Lathkill reaches Alport the river displays a series of weirs which were built during the nineteenth century to serve the booming woollen industry. 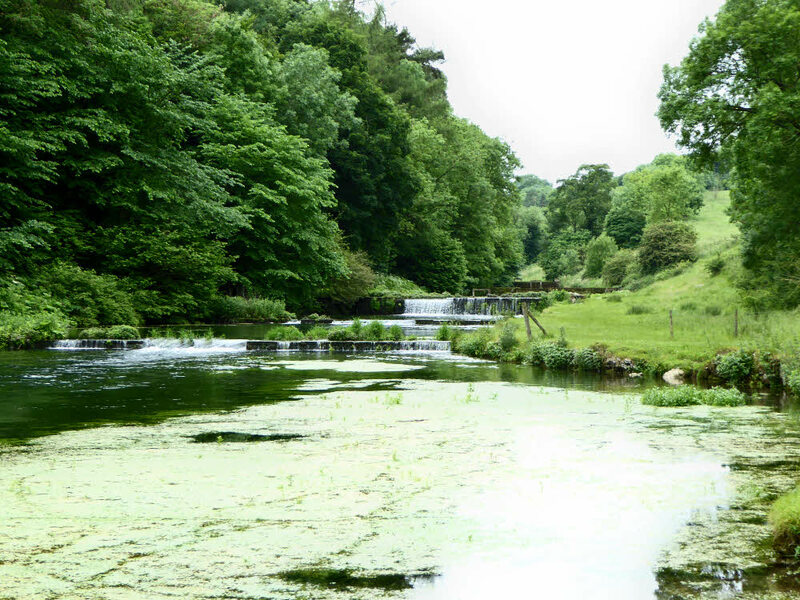 The river was also dammed to form ponds for the brown trout who’s sporting qualities resulted in the river becoming a fly fishing Mecca. 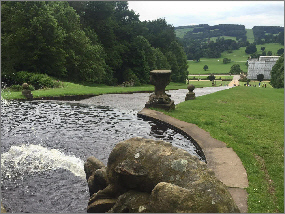 June 18th 2016, marked the day of our 14th annual fundraising nine and twenty two mile walks in and around Chatsworth House in the Derbyshire Peak District in aid of the Dave Owens and Frank Goodall Memorial Fund. The combined efforts of our sponsored walkers, together with the generosity of their valued sponsors, and also our corporate sponsors, raised another excellent sponsorship total of £7,286.50. 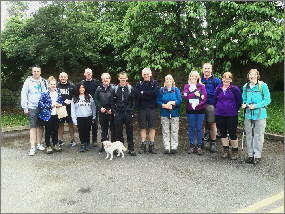 This took the accumulated fund total for all our walks to date to £161,225.29. As with every other year, every penny of the sponsorship money raised in our walks is donated to our four nominated cancer charities. 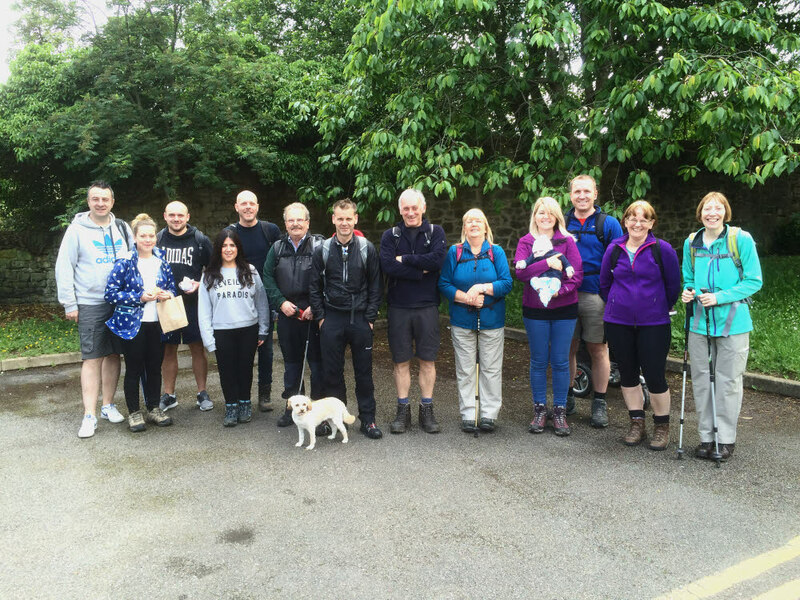 Regrettably, the 22 mile walkers broke with an honourable tradition of posing for a photograph before setting off on their walk, and so we are only able to show the starting line-up for the 9 mile walkers. The photographs too, were a little sparse compared to recent years, and rather than break the walks up into our usual 9, and 22 mile entries with only a few accompanying photographs for each, we’ve decided to bundle the whole lot together and let our Event Organiser, and usual walks narrator Gerard Mitchell sort it all out! 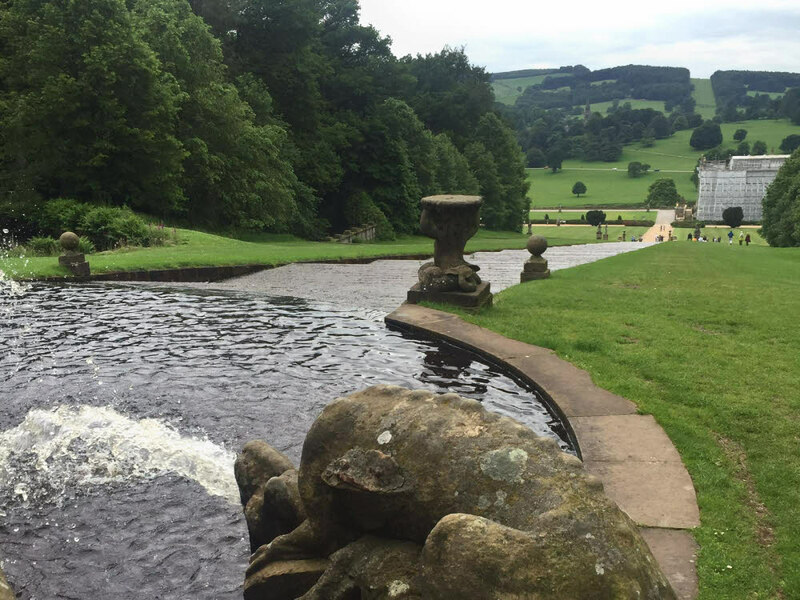 Thank you so much for fundraising for Cancer Research UK, and your recent donation of £2,367.95 (including £260.00 matched funding) raised by those taking part in the Chatsworth Challenge Walk 2016. With your support we will beat cancer sooner. Thank you very much for raising a kind donation of £2,107.95 sent in memory of Dave and Frank. You've paid a great tribute to Dave Owens and Frank Goodall. we'd like you to know how much we appreciate the fact that you've chosen to support Macmillan at this time. Your gift will help improve the lives of people with cancer and their families. Thank you for your kind donation of £2,107.95 to Marie Curie. Marie Curie delivers expert hands-on care, emotional support, research and guidance helping people living with a terminal illness. Your donation will help make this possible. 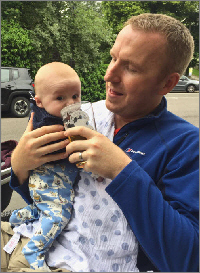 Oscar Firmin (seen here with Dad Simon), has become the proud owner of the title of ‘Youngest Fundraiser’ thanks to his praiseworthy £90.00 sponsorship contribution to this year’s walk. Raising the sponsorship, and then getting the money in is tough as all fund raisers know, so just how he managed to get his sponsors to think he could walk nine miles, or bully them into giving him the money in the first place is a mystery we may never know the answer to. 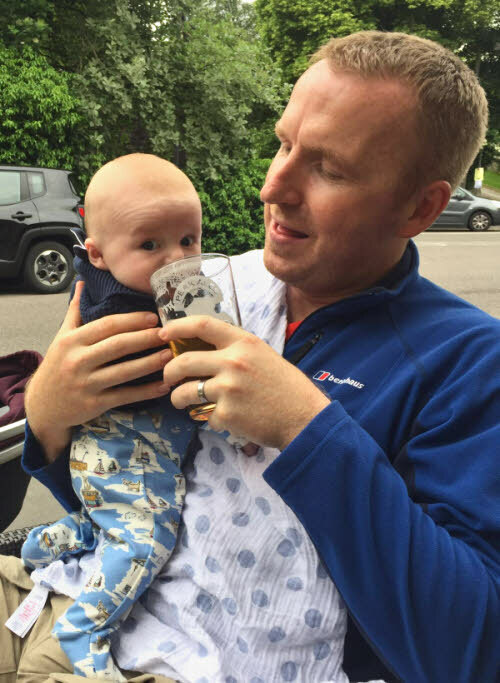 Anyway, in the traditional spirit of the Chatsworth Challenge Walk, he’s seen here celebrating with a strong pint of ale after a tough day in the Derbyshire hills.